Pat Guadagno - The New York Times hailed Pat Guadagno as“A well-traveled troubadour with a remarkable repertoire” calling his performance “A musical journey, always an unpredictable ride”. The self-proclaimed Saloon Singer, who would sooner re-tool an old song than bring a new one into the world, garnered international acclaim when his version of a Warren Zevon song was featured in the award winning Showtime Series Californication. Deeply rooted, but not mired in the Jersey Shore music scene, his latest album, New Jersey Material, features songs by some of the Garden State's foremost, and lesser known Songwriters as well as a collaboration with Grammy Award winner Keb’ Mo’. Pat’s unique interpretation of other people’s art is prominent in his recordings as well as onstage where he creates reverent theatrical tributes to artists like Van Morrison (A Marvelous Night) and Bob Dylan (BobFest). Musical Director of the highly touted Big Joe Henry Variety Show,Pat is also a proud founding member of Holiday Express, a band of professional musicians who volunteer their efforts and devote their time, during the Holiday season to sharing the gift of music with those less fortunate. Maureen McCrink - Maureen is an artist who enjoys performing diverse material, and as she enjoys her jubilee decade, has some exciting projects in the works. One is a Christmas CD with her sisters, Mary McCrink and Pat Whitaker, who were featured with her in past seasons singing with Holiday Express. Another is a collaboration with Twilight artist and "Shirley" colleague Delores Holmes at the Count Basie Theatre's Cool School -- a singing class for children. (See ad in program) There have also been rumors of a Shirley's CD. You can find Maureen performing her own music and that of other local songwriters with her wonderful husband, Michael Gribbroek on piano, on scheduled nights at McLoone's. Pam McCoy Pam McCoy, local musician, and singer/songwriter, entertains regularly in NJ/metro area restaurants and clubs, either solo, or with her group, Pam McCoy & Familiar Faces. 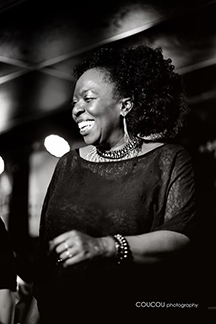 She has worked with many musicians over the last 3 decades, such as Stormin' Norman Seldin, Dr. Bob & Co, Komfort Zone, Dave McCarthy, Phil "Red River" Rizzo, Scott Paden, Lew Longo, Pat Guadagno, Rob Paparozzi, and Slick Aguilar, of Jefferson Airplane. 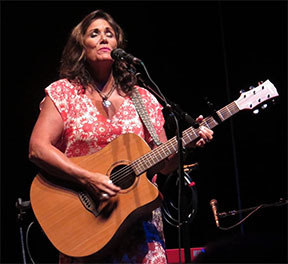 Her early training in classical vocals, glee club, and musicals evolved into playing guitar and performing folk-rock in her teens, adding blues, motown, country, pop, rock and her originals along the way. She performed at NJPAC at a fundraiser in Mar. '14, with headliner, Marty Balins, of Jefferson Airplane/Starship fame to help raise money for longtime friend, Slick, after his liver transplant, and then joined Slick again for his Jefferson Starship reunion on stage with Paul Kantner, and Steve Freiberg at BB Kings in NYC August ‘14. They perform locally together as well, in Slick & Co.
"A Marvelous Night", a Van Morrison tribute show, to benefit the organization, Autism Speaks, in November, since 2013. She has numerous studio arranging, vocal and co-writing credits with area artists. She has been a featured singer with Tim McLoone's Holiday Express since 1996, one of a number of non-profit organizations she gives her time and talent to, including the Twilight Concert for The Aids Resource Foundation for Children benefit for St. Claire's Home since 1997. A board member of Musicians On A Mission since its inception in 2010, she performs in a rotating monthly program created by MOAM, at LADACIN locations, for the children and adult clients at the facilities. Pam is currently recording her own CD of original music with good friend, Michael Ghegan, at the board, and plans an early summer '17 release. please visit her webpage for gig schedule and to hear live covers and original music. Phil Rizzo - Phil 'Red River' Rizzo has been a Jersey Shore stalwart on the bass guitar from the early 70's with unique original bands like Odin, Guildersleeve and The Candle Brothers. Later on with Classic Bands, Fourplay, Koka, Parkway Joe and the Tokens, Turnpike Mike, Four of a Kind just to name a few. Lately Phil shares his time and talents between the Pat Guadagno Band and Pam McCoy and Familiar Faces. He's always got the High Part, steady in the pocket , and never threw a gutter ball. Michael Gribbroek - A seasoned musician, Michael has played the trumpet in big bands and jazz combos throughout the Metropolitan area for many years. He has performed with Joe Henderson, Albert King, Jaki Bayard, Candido and Paul Butterfield in New York and on national tour with Skitch Henderson. He received a Master's Degree in Jazz and Commercial Music from Manhattan School of Music. He has performed with Holiday Express for the past few years and it is there he met the love of his life, his talented wife, Maureen McCrink. He can be heard locally playing with Tim McLoone's band, The Shirleys. Andy McDonough - Andy McDonough Andy's diverse musical experiences bring a unique style and expressive feeling to his musical compositions. Influences of jazz, Latin, folk, rock, gospel, blues and country are evidenced in his work along with a sometimes quizzical flair to 'tie it all together'. His lyrics run the gamut from sensitive love ballad to intense and angular commentary on mental illness and criminal behavior. Supported by his fellow musicians, songwriters and a small cache of daring and trustworthy listeners, Andy takes great solace in knowing his songs are not copies or "knock-offs" of popular music. Scott Paden - Singer/songwriter Scott Paden is one of the most versatile and intuitive vocalists to ever serenade a señorita on a Saturday night. His witty songs and perfect intonations have kept him at the forefront of the shore music scene for over 25 years. As the principal writer and arranger of Guildersleeve, Earthstar and Java, Scott's uncanny ear for harmony has assured him a place in the Jersey Shore Hall of Fame. A veteran of all eleven Twilight Concerts, Scott is also a featured member of Holiday Express. Scott is a gifted visual artist as well and has exhibited his oils and sketches all over the world. Daniel Petraitis - We lost founding Twilight Musician, Daniel J.Petraitis 10/14/57 - 6/3/09. 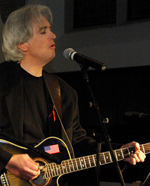 Over the past three decades singer-songwriter, Danny Petraitis, has performed with every artist featured in the Twilight Concerts. He considered it a genuine honor to participate in this event. Danny's four children: Dylan, Carson, Sadie, and Jed live in Nashville. Danny was a staff writer, director and producer at the The Gary Musick Company. He created, developed and presented major entertainment events. He produced and directed the Annual ASCAP Country Music Award Show. In January of 2010 he won an Emmy Award for his Producer role at High Five Entertainment for “Levon Helm’s Ramble at the Ryman". His son Dylan accepted the award at the MidSouth Regional Emmy Awards. Delores Holmes - We lost Twilight Musician, Delores "Dee" Holmes, (7/18/1946 - 4/16/2010). She sang with Bruce Springsteen in the late 1960's and early 70's. She performed with a myriad of rock bands, gospel groups and church choirs, including Backwoods, Soul Purpose and Rude Awakening. Dee sang backup for Bruce for his song City of Ruins on the internationally televised Tribute to Heroes telethon after 9/11. She was also a featured performer in a benefit concert for Ground Zero workers at New York's Beacon Theater with Phoebe Snow. She was member of Tim McLoone's Holiday Express and his girl band, The Shirleys. Dee was a main ingredient in the musical venture, Rain, with her daughter Layonne and Debbie Vaughn.